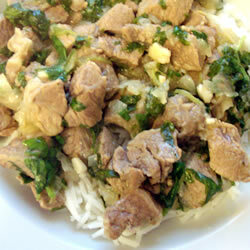 "This is a traditional Afghan stew recipe made with lamb, and seasoned with cumin and cilantro. Lean beef stew meat may be substituted for the lamb." 1. Heat 1/2 cup of oil in a large heavy skillet over medium-low heat. Add onion, and fry gently until transparent. Increase heat to medium, and add garlic and stew meat. Cook, stirring frequently, until meat is browned on the outside. Pour in the water, and season with salt, pepper, cayenne pepper and cumin. Bring to a simmer, and reduce heat to low. Cover the pan, and continue cooking for 1 1/2 to 2 hours. 2. Heat 1/4 cup of oil in a large saucepan over medium-high heat. Add rice, and cook, stirring frequently for 5 minutes. Add 6 cups water, and bring to a boil. Reduce heat to low, and cook loosely covered for about 30 minutes, or until rice is tender. 3. Add spinach and cilantro to the meat mixture, and cook for another 10 to 15 minutes. Mound the rice on a platter, and spoon some of the lamb stew over. Put remaining stew in a separate serving bowl.